"There's a scarlet thread of murder running through the colorless skein of life, and our duty is to unravel it." Look what Pat, our official Mystery Playground Librarian, found in the check out line at the local Safeway. It's a special 2017 Sherlock Holmes edition of LIFE Magazine. After getting sticker shock from the $13.99 price, inside you'll find 94 pages on every era of Sherlock from the first story in 1859 to present day movie and TV incarnations. "If you are determined on making an end of Holmes, why not bring him to Switzerland and drop him down a crevasse?" It also touches on Doyle's eventual hatred for his creation. 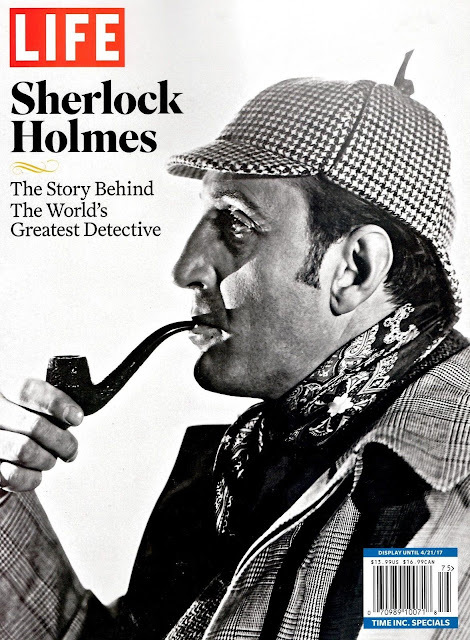 The Sherlock Holmes special edition of LIFE Magazine will be on the magazine rack until mid-April, so there is plenty of time to go pick up a copy. I know! I couldn't quite believe the price. That is a big omission. I loved those episodes. Quite right -- too frigging expensive, and what? No Jeremy Brett? Forget it. They were missing the one of the best portrayals of Sherlock Holmes! Jeremy Bret played Sherlock Holmes and his was and is the best! Nothing comes close! I have read the books several times! They have no clue. How could they leave out Jeremy Brett? How stupid are they?! They have no clue. How could they omit Jeremy Brett?! How stupid are they? A miss and a shame.